These handmade wooden toy barns make you happy people are still taking the time to use their talents to create beautiful toys. 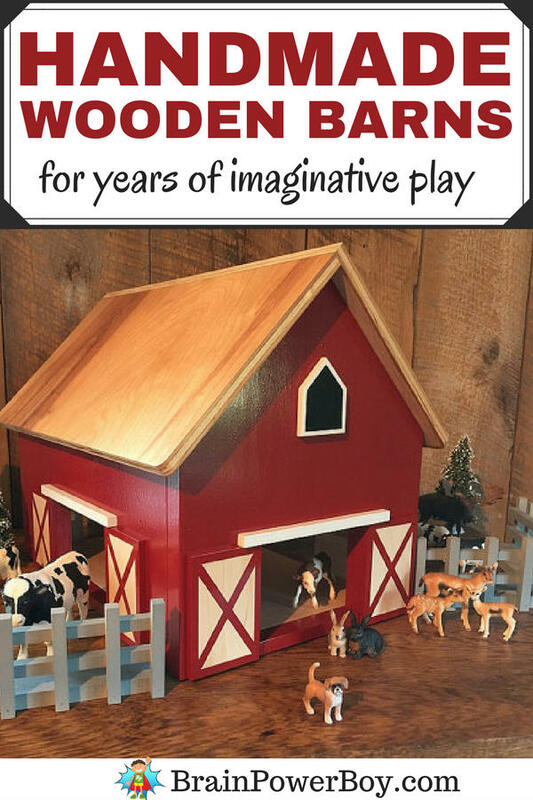 Getting one of these barns pretty much guarantees many years of imaginative play for your kids or grandchildren. The craftsmanship is impressive! These are toys you can feel good about giving. Want to Jump Right To Our Top Pick? Click HERE! 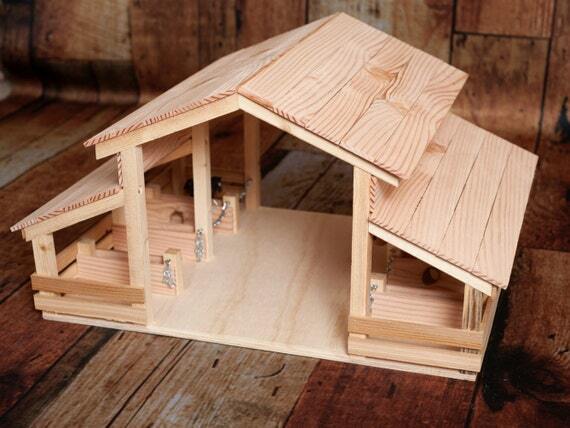 This wooden toy barn has a nice finish to it with a natural wood roof and a white barn. Comes with fence pieces and ladder. There is plenty of hand room and there are platforms inside for your child to put items on. 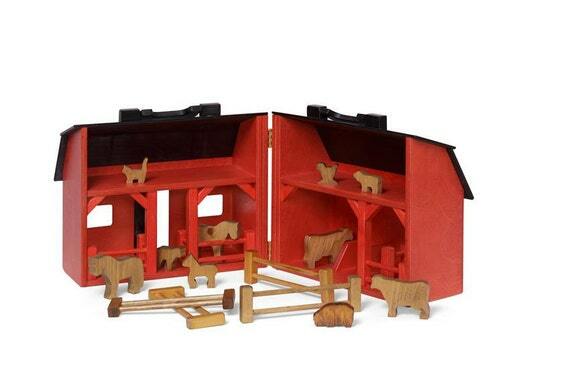 It is a very nice quality barn that I’m sure your family will play with for years to come. If you prefer a more traditional look, it also comes in red. If you are in need of a handmade barn that can fold up and be put away, you should take a peek at this one. Great for those short on space. Also nice for keeping at, or taking to, Grandma’s house! 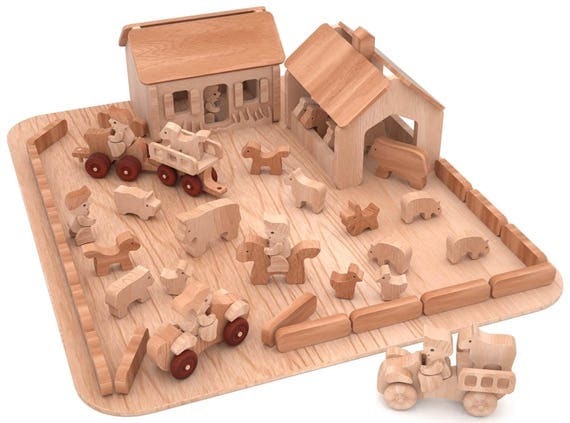 You cannot miss taking a look at this large wooden toy barn. I love how the openings are made and the style of the barn. Look at the little spot they put the cow and calf! So neat!! It comes with the neat ramp in the picture as well. I can see kids really enjoying that feature! 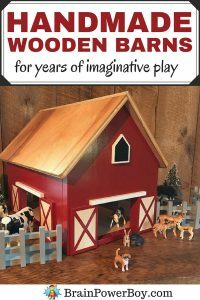 If you are looking for an even bigger wooden toy barn, try this extra-large version. It is 20″ wide x 34″ long x 24″ tall. It features a hay loft and comes with hay and straw bales (wood blocks) and fencing pieces. What I like best about it, is this barn is customizable. You can get it personalized for free! Not only that, but you have your choice of several barn color combinations as well. 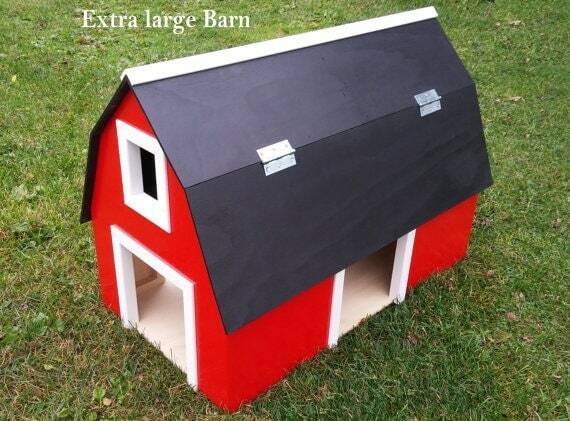 Put your family name or the child’s name on this barn to make this gift even more special. 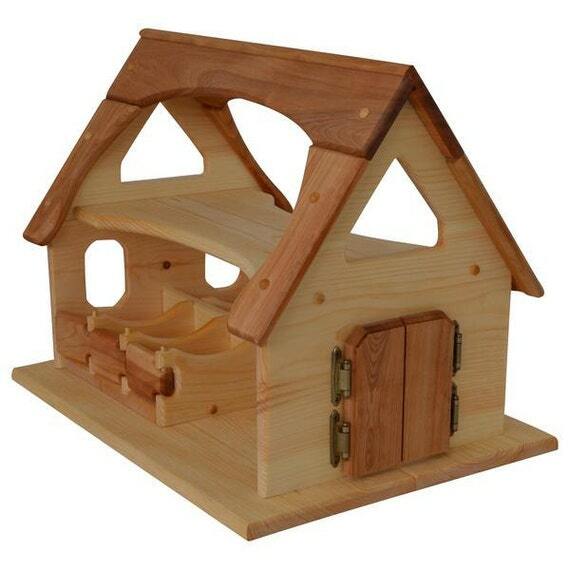 Here is a natural wood toy barn that features stalls for the animals. I think kids will really like this one because of the stalls and because they made the middle nice and wide so they can get a tractor or a truck through the center! I love that, don’t you? There is a LOT of play value here. This delightful natural wood barn has stalls as well. The wood doors to the stalls open and close. My favorite thing about this barn, beyond its natural beauty, is how open it is. This one is perfect for a family with several kids for three reasons. It is easy for kids to get their hands in because of the construction. Kids can play from both sides at once because there are stalls on both sides. It is of very high quality so you can rest assured it will last through many children. This type of farm set wasn’t exactly what I had in mind when I started this article, as I was looking for more traditional toy barns. However, I simply could not leave it out! I mean, look at it! It is completely charming. 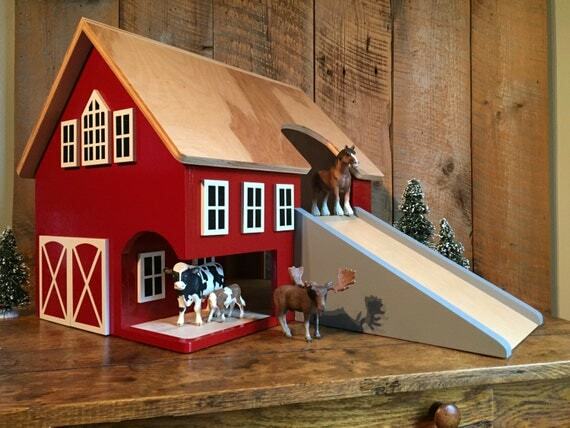 I am amazed at the workmanship of this handmade toy farm. It really comes with 49 pieces. Really! And the price is absolutely crazy low for what you get. If you want a small farm that comes with everything you could need, this is it. The legs on the people even move so they can ride in the vehicles. I’m so excited to share it with you. 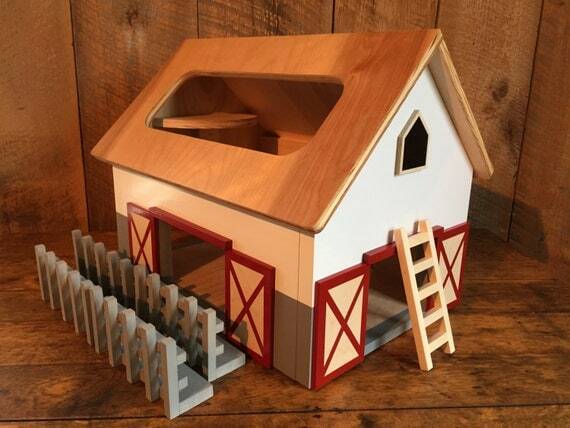 These are the best handmade wooden toy barns out there right now. 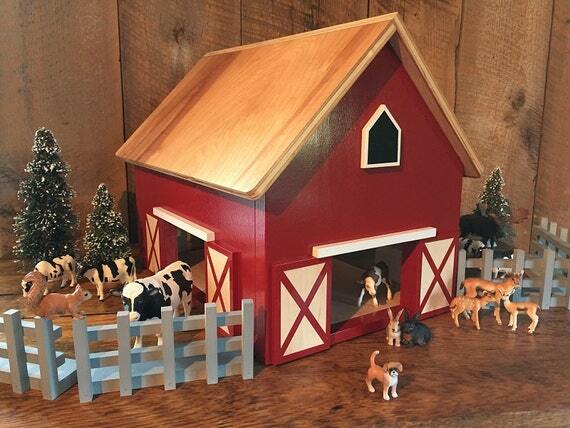 Don’t forget to check out our featured wooden farm animals if you need some to add to your barn. I also gathered together wooden toy barns from manufactures as well, so if you didn’t find exactly the right thing here, you could try this article as well.